The year is 1865 and there's a gold rush on in Australia. 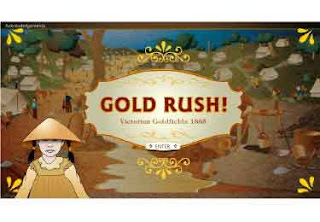 You are about to journey to the Victorian goldfields to join thousand of others trying to strike it rich. You will find yourself in Ballarat, where you can buy all you need for life on the goldfields. While the game is loading see if you can find all the mining tools in the next image.